These plug-ins are just a few clicks away. There's no such thing as a free lunch, so they say, but there's certainly such a thing as a free piece of music software. Don't believe us? Read on to discover some of the latest examples. We covered the beta version of this synth back in 2011, but version 1.0 has finally been released and adds an improved GUI with a new waveform editor. There are also new menus and lower CPU usage on user waveforms. Synthscience.com has not only redesigned its website recently, but also expanded its range of effects processors with a whopping 18 new plug-ins. You can choose from modulation, distortion/lo-fi, dynamics, filter/EQ and delay/reverb processors, so dive in and explore. 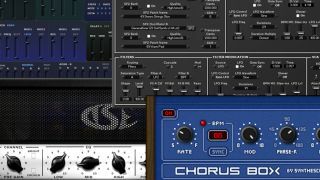 TSE's latest emulation is of a famous US guitar amp that's been used on a lot of metal records. There were actually two very similar versions of said amp, so you get two separate channels. If you like the plug-in, consider giving the developer a donation. A two-oscillator SF2 SoundFont/subtractive synthesis instrument that features full controller MIDI Pitch Microtuning, meaning that you can use it to experiment with alternative intonation systems. Load in your samples and put them through the synth engine to create new timbres.